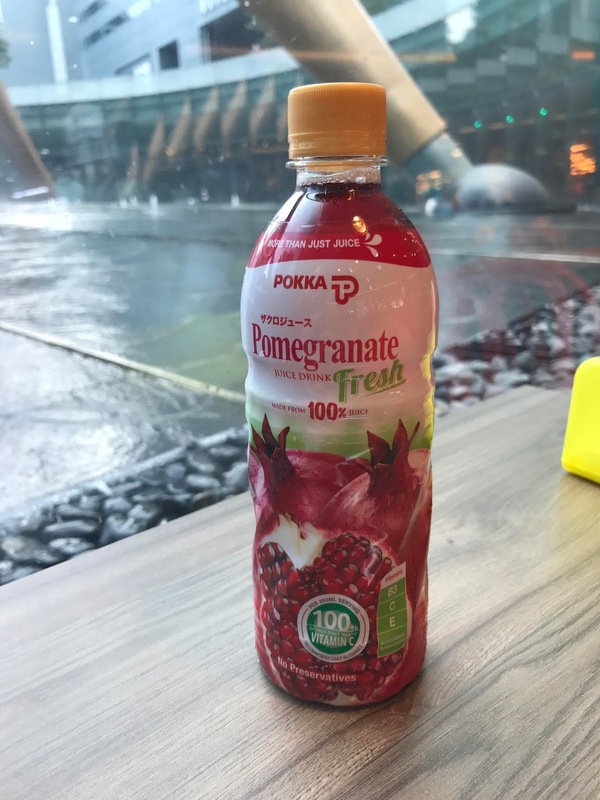 I was on a pomegranate kick, so when I saw this Pokka Pomegranate Juice for 1.50SGD in FairPrice (Singapore grocery store). It's probably a super lame thing to write about, but I'm fine being lame. It's free of preservatives and made with 100% juice. When I read that, I thought of POM Wonderful, which is also 100% juice, with no sugar added, and no preservatives. The Pokka Pomegranate juice was SO MUCH cheaper, though. That being said, I think they're actually pretty similar, but maybe it's because I haven't had POM in a while. The Pokka was also pretty thick, but kind of tasted like there was maybe some sugar added. You could also tell it's a fruit juice, as in they added some water to it to make it more fluid. It kind of tasted like a combination of grape juice and prune juice, if that makes sense. It was semi-refreshing, but a citrus flavor would probably be more refreshing. I could see this being a good when combined with like a Sprite or club soda or something like that. Maybe I'm just dumb and this was supposed to be mixed with something else? I was having English overload and also was going crazy being surrounded by all the international (read: Western) groceries, so I don't think I read the label that closely. That being said, I also can't remember if it was from concentrate.